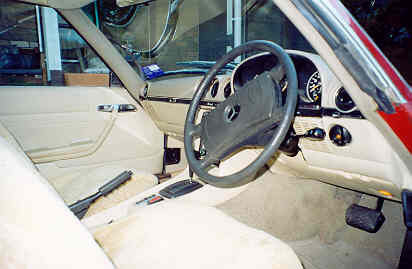 MERCEDES 450 SLC CLASSIC SPORTS SEDAN. 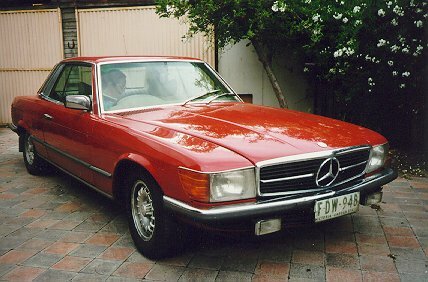 It is with great reluctance that I am obliged by law - that of my wife and nature - that I place on the market a most unique and beautiful car - this Mercedes 450 SLC classic sports. She has been SOLD - see below. If the new owner happens to come upon this website, please get in touch. I'd like to know that she is in good hands. I believe she ended up in Queensland and is being restored. Wonderful! Like a loveable pet that had been so much a part of the family for twelve years, dear Leanne has been sold, hopefully to a more careing family - or enthusiast. She had served us well, but now that Sam was growing so fast, he sat in the back seat like Easy-Rider, a far from comfortable position. It was time to come to our senses and buy somthing a bit more realistic for our family needs. We were all sad to see her go, especially Sam, but thats the way it is. I do hope she finds a good home as we traded her in on a - well, its no comparision, but a Mitsubishi Outlander. And boy, did she go cheap! (Sam on her last day with us, on 21 April 2008). It would be superfluous to extol the virtues of the Mercedes, particularly these classic sports cars that were manufactured during the 1970s and early 1980s. This particularly car has an interesting history. It was initially purchased by Dr Edelsen (who bought the Sydney Swans football team), for his wife Leanne. (Hence we have always referred to the vehicle as Leanne). It passed on to a Victorian politician who eventually lost his seat, a taxi-owning millionairre, a Melbourne builder and then myself, a publisher and author. (There may have been other owners but I am not aware of them). 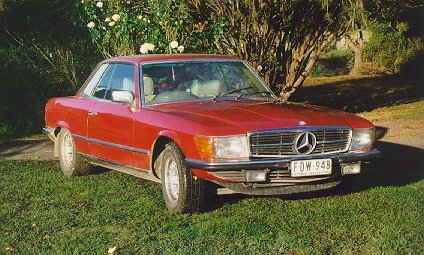 This vehicle was, I believe, built in 1976, and probably imported from Mercedes in South Africa so I am told, and since then has done very few miles - see below. I was also told that it may have been imported illegally, seized by customs, and sold by auction - then bought by Dr. Edelsen. I have no means of verifying this but it seems plausable. 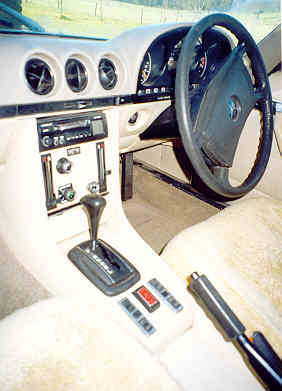 It is in fine condition, with auto-transmission and a micro-oil filter system installed, probably on manufacture. It is a delight to drive, with a magnificent Blaupunkt cassette/radio system, which at the moment (the casette player) does not work. 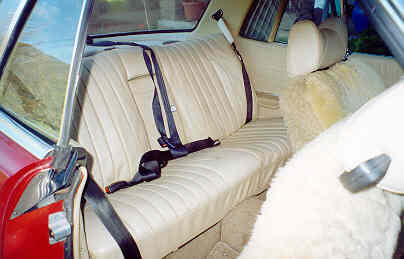 The cream upholstery is in perfect condition (we have wool covers on the front seats), and the duco is red as you can see. I bought it in November 1996. I was looking for a more traditional Mercedes sedan, but a once-in-a-lifetime opportunity arose to purchase Leanne, so we thought, why not. At the time I was waiting patiently to become a grandfather for the first time (realised on 30 April 1999), but nature had other grand plans. On 22 February 1999 my wife gave birth to a wonderful boy, Sam. He was a truly miracle baby and thus quite unexpected, I being 55 years of age at the time, my wife younger but never expecting to have children. Since then, we have also moved to to a small country property where we can give Sam plenty of room. (We lived in Yarram, a delightful town south of Traralgon in the South Gippsland area of Victoria - we are now ten minutes from town). 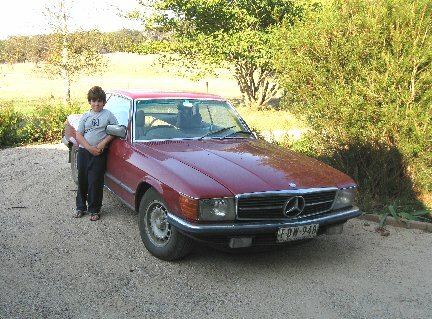 Now, having a young boy, and living in the country, are perhaps not the right combination to own a Mercedes sports - not for us anyway. There is not all that much room in the back seat, and with his car seat, Sam now sits up like easy-rider with his feet in our ears! So, Leanne is for sale. It is registered (Victorian) to June each year. Vehicle is located near Yarram, Gippsland, 200 km east of Melbourne, and is always garaged when not in use. I do not fiddle with cars. This vehicle has been maintained by two specialists mechanics, one trained by Mercedes in Germany. His name is Peter Nitzche in Port Albert, the other Alan Baggaley in Yarram. Peter has long retired. Alan is a genius and a delightful man who owns Baggaley Motors in Yarram - I have no hesitation in giving his phone number to genuine enquirers. Since I have owned it, I have had the front brakes completely done, and the exhaust renewed. It has had regular services and as it is a third car, has been mainly used for occasional trips to Melbourne, and the Latrobe Valley. I know little of these matters, but I understand that it has KA injection fitted. The special oil filtration system uses extra fine synthetic oil for minimum engine wear. It has a Wankler transmission. The differential has a slight whine which I am told is typical of this make. Peter Nitsche had the differential reconditioned several years ago when in the hands of the previous owner. 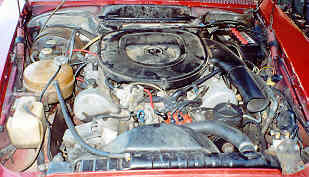 I must emphasise that the engine is in perfect condition, having done so few miles. Indeed, we dont do kilometers - its miles as per the speedo and odometer. It drives like a dream. I am most reluctant to sell the vehicle as it is truly one of the finest cars ever built. But children, toys, sports gear and wife's clearout of every Ikea store she comes across does not go with a Mercedes sports, so it must be sold. Contact me via mail, phone, fax or email - below. Miles as of 9 December 2004 = 123750 = 198,000 km. (Thats all). Odometer and speedo in miles per hour. (Previously June 2003 = 118,000 miles = 188,000 km thus only 4,000 km in eighteen months). Manufacturers plate shows Daimler-Bemz Stuttgart, built in Germany. Model 107. No Australian compliance plate. (These came into use for imported vehicles around 1980 I believe). Slight damage to rear driver side mudguard, showing duco scraping, and also pitting due to build up of rust on edge. Above photo shows child harness in place.